Just before cooking, clean clams by immersing in cold water for 20 minutes and lift clams out of the water and sand that has collected. Use a toothbrush and scrub the clam shell to remove sand and barnacles. Bring 6 cups of water to a boil and add 2 tbsp salt. Cook linguine until al dente (about 8 minutes). Drain and reserve 1/2 cup of the pasta water. Crisp the guanciale (or pancetta), then discard about about half of the rendered fat. Reserve and blot the guanciale on a paper towel and crumble. In a Dutch oven or Le Creuset pot, heat the olive oil under medium-low and add the garlic and crushed red peppers, add the reserved rendered fat from the guanciale, then add the clams, turn up the heat to medium, and cover. 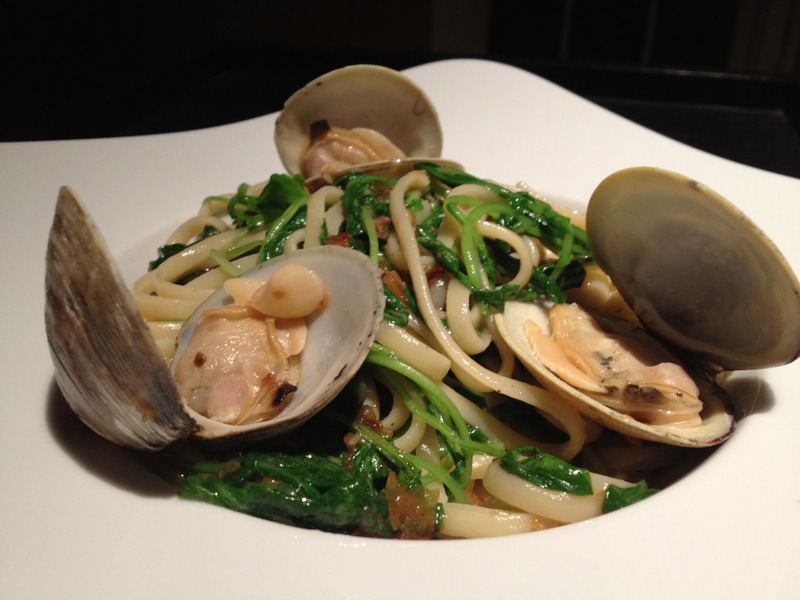 After the clams open (about 3 minutes), remove the clams immediately to avoid overcooking. Add the wine and pasta water, then arugula (or spinach) to the pot and toss quickly. Add pepper to taste, then add crumbled guanciale. Toss well. Transfer to bowls, and top with clams. Add a squeeze of lemon to each bowl and serve.